I have very good news and some kinda bad news. But the good news is that this was actually a very good week! This year has been pretty terrible so far for me, as the direct follow-up to my exhausting 2017. I mentioned a couple of times that I was burned-out during the first few months of 2018, but it seems I still didn’t fully recover 7 months later. This year has been a struggle because of that but it feels like things are finally looking up right now. Either way, that game with the ball and the funky background, it’s going along really well and I’m very happy to be working on it! The goal of the game is to push the button which is somewhere on a wall. The character you’re doing this with can only be controlled through jet-packs, going in the four directions. Once you press the button, you’re glitched out into a new level where a new button awaits you. Levels get more difficult as you go. You want to go as far as you can. With the design currently planned (there might be changes), the difficulty will appear in 2 forms. The first one would be the death blocks you can see on the gif above. Touching them hurts you and make your light go out (literally) but you can melt them with your jet-packs! The second form will be ‘enemies’ (not yet implemented) which won’t do damage to you but instead will push you around and into the death blocks. I *think* you will be able to defeat those enemies with the jet-packs as well. Currently I’m trying to figure out a progression for the game and how that difficulty will present itself effectively. Ideally there would be bosses and an ending which you could avoid to get even more challenge, like in Nuclear Throne. Maybe there should be upgrades of some sort but I’m really not sure about that. There’s work to be done on defining all that. On the other side of the coin though, I’m having a lot of fun working on the aesthetic of the game which really is getting defined by itself at this point. I’ve added a little face to the character you’re controlling and then worked those 18 black pixels to death, showing the way you’re pushing this little guy, showing triumph when defeating enemies, showing pain when getting hurt, and most of all showing unconditional happiness. I’m also experimenting with the background which will definitely change throughout the game. Each level will show different patterns, with different sets of colors. This would go along with the progression stuff and so the details are still, in part, to be defined. Particle effects are also getting into the party already. 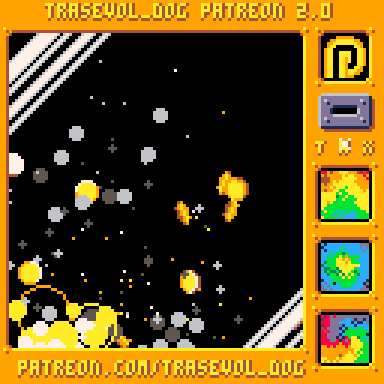 For now it’s mostly smoke particles but you know there will be glittering, there will be little stars and there will be explosions of some sort. I simply cannot help it. And of course there’s the new glitch effect I’m showing off in that last gif! I’m actually treating it as a particle effect too on the code side! One glitch particle will simply copy a part of the screen memory onto another part of the screen memory. It will linger there for a random time but it may also expend and even clone itself, which makes it look particularly chaotic and that’s exactly what I was looking for! By the way, I’m considering writing a Doodle Insights on glitch effects! It would include these glitch particles but also the way I did it in my Pico-8 games/experiments and in Blast Flock which was made with Love2D. Is that something you’d be interested in? Please let me know! So obviously this game is taking bigger proportions than previously anticipated. From my point of view, this is not really a bad thing. In fact it could be a very good thing. I’ve been wanting to make a commercial game for a while now. I need it to be interesting, to feature things I’m good at, and not to be too ambitious. This game has more potential than most of the ideas I’ve had this year and right now I feel like I have the energy to go through with it. This game could be my first game on Steam, it might even get onto the Nintendo Switch if that gets to be an option at all. From there, even if it doesn’t do well, it will bring me some amount of money that will go on top of my Patreon income which, sad to say, is not enough at the moment. Still, let’s hope that it does actually do well. That said, and yet again, my Patreon income is something as well and you can’t know how grateful I am for it. In fact, without it I might have simply abandoned by now. But I didn’t, and I won’t, and it’s all in a huge part thanks to my Patreon supporters. This week was a really good week, and hopeful too. I absolutely need to find a name for this game so that I can call it something else than “this game”. But I’m very happy with how it’s coming along and I’m pumped to work more on it! This coming week, I am still working on this game and probably on SUGAR too. I’ve already been making more tiny changes but some slightly bigger planned features might get useful very soon if I implement them by then. You’ll know more next week! Take care and stay hopeful!